The upcoming expansion for the sprawling WW2 grand strategy title will be released before the end of the month. A sizeable patch will sortie from port alongside the release. It’s been almost a year since the last DLC release for Paradox Development Studio’s ambitious grand strategy title. Hearts of Iron IV allows you to control any nation on the planet starting from 1936 and allows you to shoulder the struggles of the Second World War. The previous expansion, Waking the Tiger, enhanced the experience of fighting a land war in Asia and Man the Guns promises to do much more for the naval aspects of combat. Nations like the Netherlands, the UK, and USA will be getting the lion’s share of attention this time around but there seems to be plenty of changes to go around for everyone in this naval-themed expansion. Major Alternate Paths: Revive the Old Confederacy as the United States and provoke a new civil war, or hasten decolonization of the British Empire. Ship Design: Research new components and refit older vessels to take advantage of new knowledge. Outfit your submarines with snorkels or improved stealth. Admiral Traits and Skills - Tailor and level up your Admirals with new traits and skills. Governments in Exile: Welcome a government in exile to your democracy, boosting their legitimacy in return for more manpower and elite troops fighting to free their homeland. Other National Focuses: New national focuses for The Netherlands and Mexico. Naval Mines: Protect your coasts from invasion or assault with anti-ship mines, or clear a path through enemy mines before you make the big push. Shipping route controls - plot new routes for your shipping and navies by marking areas you want to avoid. Naval Treaties: Struggle to keep the peace by following internationally agreed upon rules, or creatively defy the world consensus by exceeding your limits. Amphibious Landing Vehicles: Add power to your beach landing by researching and producing specialized combat vehicles for your marines. 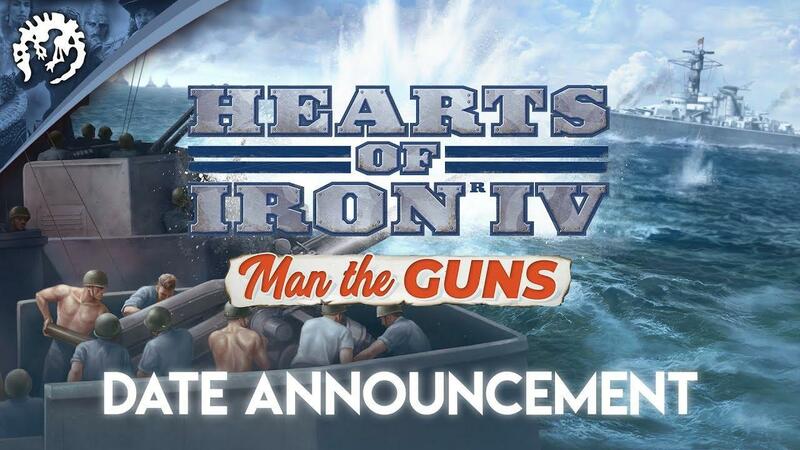 New Music: Original music composed specifically for the Man the Guns expansion. A lot more content will be coming for free in the form of a patch that’s set to be released alongside the DLC. Players can expect things like training for pilots and sailors, naval areas having terrain, as well as the introduction of fuel as a resource to the game. These additions range from various quality-of-life and bug fixes that will be making their way into the game to new features. To see a fuller picture of what’s being added or changed about the game, I urge you to check out the developer diaries. Man the Guns will be out later this month and you can already preorder if you like. As always, we advise against preordering on principle but you can do so on Paradox’s own webshop or on Steam. As much as I can see why people would think like that, but if there is ONE publisher on Earth I trust blindly to deliver their Linux promises, it's Paradox. So true. Paradox is the only publisher I preorder from.